You will learn how to use the ArgumentParser class to parse command line arguments. This tutorial is a walk-through with links into the API documentation and also meant as a source for copy-and-paste code. The simplest possible and also most flexible interface to a program is through the command line. This tutorial explains how to parse the command line using the SeqAn library’s ArgumentParser class. Robust parsing of command line arguments. Simple verification of arguments (e.g. within a range, one of a list of allowed values). Automatically generated and nicely formatted help screens when called with --help. You can also export this help to HTML and man pages. You are able to automatically generate nodes for workflow engines such as KNIME or Galaxy. # modify_string --uppercase -i 2 "This is some text!" Two flag options --uppercase and --lowercase that select the operation. One (value) option -i that selects the period of the characters that the operation is to be applied to and is given a value (2 in the first call above, 1 in the second). One (positional) argument with the text to modify ("This is some text!" in both calls above. In contrast to options, arguments are not identified by their names but by their position. Command line options can have a long name (e.g. --lowercase) and/or a short name (e.g. -i). The following small program will (1) setup a ArgumentParser object named parser, (2) parse the command line, (3) exit the program if there were errors or the user requested a functionality that is already built into the command line parser, and (4) printing the settings given from the command line. Such functionality is printing the help, for example. // If parsing was not successful then exit with code 1 if there were errors. // Otherwise, exit with code 0 (e.g. help was printed). // Extract option values and print them. Let us first play a bit around with the program before looking at it in detail. Period to use for the index. While already informative, the help screen looks like there is something missing. For example, there is no synopsis, no version and no date of the last update given. We will fill this in later. text       This is a test. When we try to use the --lowercase/-L option, we get an error. This is not surprising since we did not tell the argument parser about this option yet. Then, we define a positional argument using the function addArgument. The function accepts the parser and an ArgParseArgument object. We call the ArgParseArgument constructor with two parameters: the type of the argument (a string), and a label for the documentation. Then, we add options to the parser using addOption. We pass the parser and an ArgParseOption object. The ArgParseOption constructor is called in two different variants. Within the first addOption call, we construct an integer option with a short and long name, a documentation string, and give it the label “INT”. The second option is a flag (indicated by not giving a type) with a short and a long name and a description. Next, we parse the command line using parse. We then check the result of the parsing operation. The result is seqan::ArgumentParser::PARSE_ERROR if there was a problem with the parsing. Otherwise, it is seqan::ArgumentParser::PARSE_OK if there was no problem and no special functionality of the argument parser was triggered. The command line parser automatically adds some arguments, such as --help. If such built-in functionality is triggered, it will return a value that is neither PARSE_ERROR nor PARSE_OK. The following two lines have the following behaviour. If the parsing went through and no special functionality was triggered then the branch is not taken. Otherwise, the method main() is left with 1 in case of errors and with 0 in case special behaviour was triggered (e.g. the help was printed). Finally, we access the values from the command line using the ArgumentParser. The function getOptionValue allows us to access the values from the command line after casting into C++ types. The function isSet allows us to query whether a given argument was set on the command line. If the option a is not a list then the occurence -a 3 overwrites all previous settings. However, if a is marked to be a list, then all values (1, 2, and 3) are stored as its values. We can get the number of elements using the function getOptionValueCount and then access the individual arguments using the function getOptionValue. You can mark an option and arguments to be lists by using the isList parameter to the ArgParseArgument and ArgParseOption constructors. For example, if the program has three arguments and the first one is a list then arg0 and arg1 would be the content of the first argument. If it has two arguments and the last one is a list then arg1, arg2, and arg3 would be the content of the last argument. Copy the source code of the full First Working Example above into a demo. Compile it and test printing the help screen and calling it with the two command lines above. Adjust the program from above to also accept an option to convert characters to lower case, just as it accepts options to convert characters to upper case. The long name should be --lowercase, the short name should be -L. As for the --uppercase option, the program should print whether the flag was set or not. Copy the two lines for defining the --uppercase option and replace the strings appropriately. Note that we are giving the default value as a string. The ArgumentParser object will simply interpret it as if it was given on the command line. There, of course, each argument is a string. Adjust the previous program to accept default values by adding the setDefaultValue() line from above into your program. Instead of just printing the options back to the user, we should actually store them. To follow best practice, we should not use global variables for this but instead pass them as parameters. We will thus create a ModifyStringOptions struct that encapsulates the settings the user can give to the modify_string program. Note that we initialize the variables of the struct with initializer lists, as it is best practice in modern C++. Click more… to see the whole updated program. As a next step towards a cleaner program, we should extract the argument parsing into its own function, e.g. call it parseCommandLine(). Following the style guide (C++ Code Style), we first pass the output parameter, then the input parameters. The return value of our function is a seqan::ArgumentParser::ParseResult such that we can differentiate whether the program can go on, the help was printed and the program is to exit with success, or there was a problem with the passed argument and the program is to exit with an error code. Also, note that we should check that the user cannot specify both to-lowercase and to-uppercase. This check cannot be performed by the ArgumentParser by itself but we can easily add this check. We add this functionality to the parseCommandLine() function. Click more… to see the updated program. // We require one argument. // If both to-uppercase and to-lowercase were selected then this is an error. // Parse the command line. The command line parsing part of our program is done now. Let us now add a function modifyString() that is given a ModifyStringOptions object and text and modifies the text. We simply use the C standard library functios toupper() and tolower() from the header <cctype> for converting to upper and lower case. setting lists of valid values for each option. In this section, we will give some examples. The functions setMinValue and setMaxValue allow to give a smallest and/or largest value for a given option. Of course, this only works with integer- and double-typed command line options. We can pass both the short and the long option name to these functions. The value is given as a string and parsed the same as parameters on the command line. Use the function setMinValue to set a minimal value of 1 for the parameter --period. Sometimes, it is useful to give a list of valid values for a command line option. You can give it as a space-separated list in a string to setValidValues. The check whether the value from the command line is valid is case sensitive. There are two slightly more special option and argument types: paths to input/output files and tuple values. In the near future, we plan to add basic checks for whether input files exist and are readable by the user. You will still have to check whether opening was successful when actually doing this but the program will fail earlier if the source file or target location are not accessible. The user will not have to wait for the program to run through to see that he mistyped the output directory name, for example, and you do not have to write this check. For workflow engine integration, the input and output file options and arguments will be converted into appropriate input and output ports of the nodes. You can use the previously introduced restrictions to specify what kind of files you expect and the ArgumentParser will check while parsing if the correct file type was provided. The restrictions are added by defining the expected file extension. Again multiple values are provided as space-separated list. Note that the file ending check is case insensitive, so you do not need to provide txt and TXT. Replace the argument TEXT by a command line option -I/--input-file in the program above. The program should then read in the text instead of using the command line argument. We will also replace the text member of ModifyStringOptions, you might wish to do the same. We add two parameters after the label "BEGIN END" for the documentation. First, we specify that the option is not a list option (false) and second, that we need exactly two numbers for it. We use the four-parameter variant with an integer index of getOptionValue to access the entries in the tuple given on the command line. Add a command line option --range to the ArgumentParser in the program above. Modify the function modifyString() such that only parameters in the given range are changed. We will add two unsigned members rangeBegin and rangeEnd to the ModifyStringOptions struct, you might wish to do the same. Another very useful feature of ArgumentParser is that you can embed rich documentation into your programs. You can set the short description, the version string, date, synopsis and add text documentation settings. Let us first set the short description, version string, and date in our program from above. We insert the following lines just after the declaration of the variable parser. After the line with setDate(), we give a usage line and add to the description. This information will go to the Synopsis section of the program help. "This program allows simple character modifications to "
The formatting of command line parameters might seem strange, at first: Font operators start with \f (which means that they start with "\\f" in in C++ string literals). The \\f is followed by the format specifier. The format specifier can be one of I, B, and P. I selects italic text (underlined on the shell), B selects bold and P resets the formatting to normal text. These font operators are legacies of man pages from Unix and offered a simple-to-implement solution to text formatting. For example, "Words \\fBwere\\fP made for \\fIbeing\\fP written!" would result in the formatted string “Words were made for being written!”. Note that formatting the command line relies on ANSI escape codes which is not supported by modern Windows versions. If you are using Windows, you will not see bold or underlined text. The argument parser will add some options of its own, for example for printing the help and displaying version information. To separate our arguments from the autogenerated ones, we add the following line. This line will introduce the section “Modification Options” in the Description section of the output. Finally, we will add a section with examples. Add the following lines just before the line with the parse() function call. "Print \"veryverylongword\" with every third character "
That were a lot of changes! Click more… to see the complete program. // Set short description, version, and date. // Define usage line and long description. 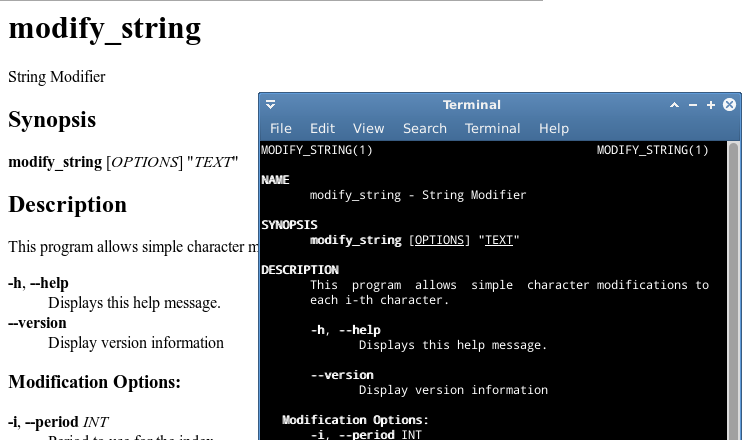 "\\fBmodify_string\\fP \\fB-L\\fP \\fB-i\\fP \\fI3\\fP "
Let us look at the resulting documentation. Simply call the new program with the --help option. Period to use for the index. Default: 1. Print upper case version of "veryverylongword"
Print "veryverylongword" with every third character converted to upper case. Also, there is an undocumented option called --export-help that is automatically added by ArgumentParser. You can call it with the values html and man. If the option is set then the argument parser will print the documentation as HTML or man format (man pages are a widely used format for Unix documentation). Below, you can see a part of the rendered HTML and man pages generated by the commands above. For further deading, have a look at the ArgumentParser class. With the seqan-2.3.0 release applications, using the ArgumentParser, check SeqAn servers for version updates. The functionality helps getting new versions out to users faster. It is also used to inform application developers of new versions of the SeqAn library which means that applications ship with less bugs. The version information you receive depends on whether you are an application user or developer. We differentiate this by inquiring the NDEBUG (no debug) macro. [APP INFO] :: There is a newer version of this application available. [APP INFO] :: If this app is developed by SeqAn, visit www.seqan.de for updates. [SEQAN INFO] :: There is a newer SeqAn version available! [SEQAN INFO] :: Please visit www.seqan.de for an update or inform the developer of this app. If you are working on your own application, using the SeqAn ArgumentParser, we will inform you about the possibility to register your application with us. This will make the distribution of your application version simple and convenient. [SEQAN INFO] :: Thank you for using SeqAn! [SEQAN INFO] :: You might want to regsiter you app for support and version check features? [SEQAN INFO] :: Just send us an email to seqan@team.fu-berlin.de with your app name and version number. The process of checking for a new version happens at most once a day and takes at most three seconds enforced by an internal timeout. The runtime of your application might be slightly affected by the process of checkng the version. You might want to temporarily switch off the option while doing sensible performance measurements (--version-check OFF). The purpose of this transmission is to provide accurate update data for your app. Beyond the update information, we may count the total number of version requests and may also resolve them to geographical regions. This may be used for anonymized analysis by the SeqAn team, but raw data is never shared with third parties. There is no form of user identification and no tracking. IP-Addresses are never stored permanently. SeqAn collects no information regarding your use of the application, like selected options or arguments provided, and of course no information on your files! rebuild the application and specify -DCMAKE_CXX_ARGS="-DSEQAN_DISABLE_VERSION_CHECK=YES" to completely remove all codepaths related to this feature.